Original proof by Sunny Snaith. The center angle of the triangle is Θ. 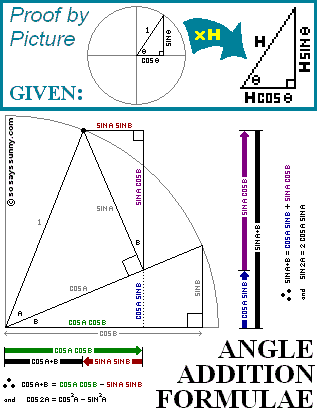 The hypotenuse is 1 (a radius of the unit circle). The side adjacent is cos Θ. The side opposite is sin Θ. The angle between the adjacent and opposite sides is a right angle. The angles stay the same. The sides are all multiplied by H.
The hypotenuse in this example would become 1 × H = H.